What is the CryptoWall Ransomware? The CryptoWall Virus is a ransomware Trojan that carries the same strategy as a number of other encryption ransomware infections such as Cryptorbit Ransomware or CryptoLocker Ransomware. The CryptoWall Ransomware is designed to infect all versions of Windows, including Windows XP, Windows Vista, Windows 7, Windows 8 and Windows 10. As soon as the CryptoWall Ransomware infects a computer, the CryptoWall Ransomware uses the RSA2048 encryption to encrypt crucial files. The CryptoWall Ransomware prevents computer users from accessing their files, which will be encrypted and unopenable. What kind of money they want? 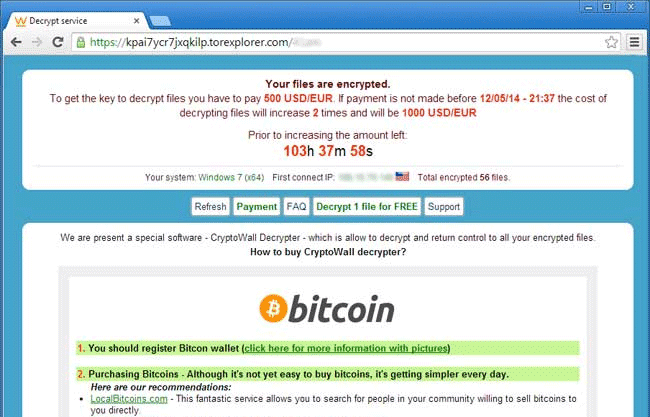 The CryptoWall Ransomware demands for $500 USD to recover the encrypted data. The payment is demanded using TOR and Bitcoins. DO NOT PAY THEM! There's a chance they will not decrypt for you even payment is being issued. Power down the CryptoWall Ransomware Virus infected computer and wait for 30 Seconds before you turn on. Use the System Restore to restore back to the earlier restore point BEFORE the infection. Restart the computer. Once the computer restarted, your computer should be cleaned without the CryptoWall Ransomware pop-up.